Every issue we provide a roundup of sociologists, and sociology, in the news. 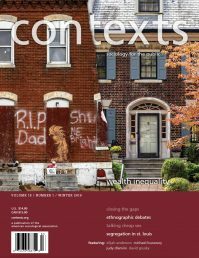 This issue we find sociologists commenting on gender in “The Great Recession,” the flesh trade, and affirmative action in college admissions. The Contexts Graduate Student Board is a collection of graduate students in the Department of Sociology at the University of Minnesota.